He carefully explains how he recommends first smoothing the monthly data with a "central moving average". He recommended "Calculating the average over 121 months (the month being calculated, plus 60 months on either side)", and promptly did something different. He extended the average at each end, meaning that for the months at either end his "average" was of a shorter period. Seven year average - three years either side of each year. Apart from noticing the alarming rise in surface temperature since the beginning of last century, you'll probably think that an eleven year moving average is a bit long. I think it is. I've included a seven year moving average so you can see how the eleven year moving average cuts off the peaks and troughs a lot more than the seven year moving average. Moving along :) The next task that Sheldon suggested was to plot the rate of change, which he showed in the chart below. Sheldon thought it worth reporting that the rate of change of temperature was higher in the 1930s than it has been since. I can understand him saying that. There was a sharp rise in temperature in the 1930s, as you can also see in the top charts. It was followed by a sharp drop in temperature too, which Sheldon doesn't remark upon. However it didn't get back as low as it had been before. 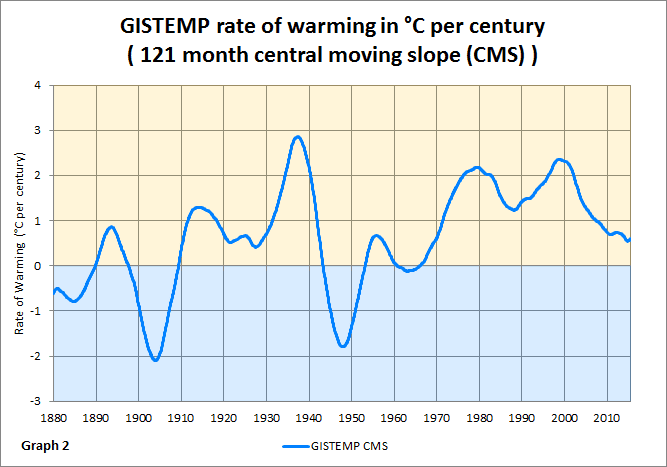 In fact there hasn't been a negative rate of warming since around the middle of last century. (I also think some of the rise in the 1940s is spurious. As I understand it, it's mostly from sea surface temperature, most of which came from wartime vessels - and it's not reliable. It probably needs better calibration against the measurements before and after the war.) Anyway, what I view as the takeaway from looking at the surface temperature trends is the rate of increase has been in positive territory since the 1960s. The temperature of the past few decades has not stopped rising. So, the next time that you hear somebody claiming that Global Warming is accelerating, show them a graph of the rate of warming. Some climate scientists seem to enjoy telling us that things are worse than predicted. Here is a chance to cheer them up with some good news. Somehow I don’t think that they will want to hear it. It will probably be many centuries before the world sees temperature of the 1930s again. Maybe many thousands of years. That brings me to another analysis that I've written about before here and here. It was a change point analysis done by Niamh Cahill, a student of Stefan Rahmstorf. The work was written up and presented in a paper recently that they got published in Environmental Research Letters. 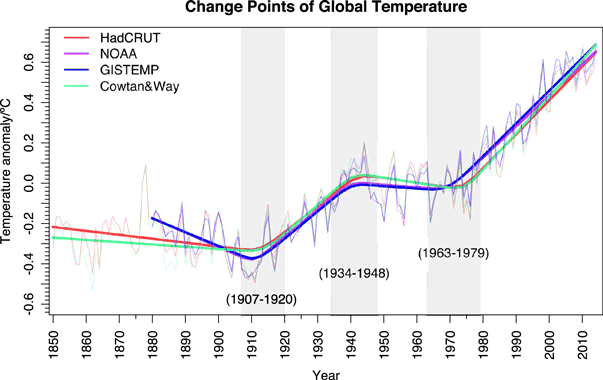 That was a much more meaningful analysis, which showed when global mean surface temperature changed in trend. The analysis does show a change point where Sheldon's chart goes from a high rate of increase to a negative slope. It shows another change point between 1963 and 1979, when the surface temperature went up again. The point being that it makes little sense to pretend there's been a linear increase for the past 120 years or so. There hasn't. 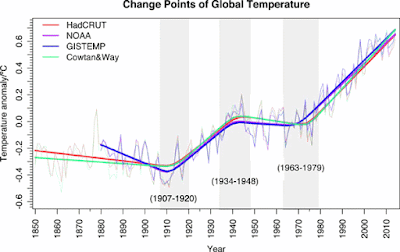 The trend in global surface temperature has changed over the past several decades. The other point is that if you look at the trends of the three latest periods, the most recent does have a steeper slope than the 1934 to 1945 period, though though the error margins overlap. Pointless using GISS or any of the land or land/sea data for anything but a good laugh. The extent of “administrative” changes have rendered all of them useless. Michael Wassil probably wonders why the scientists slipped up in 1999, 2000, 2001, 2002, 2003, 2004, 2006, 2007, 2008, 2009, 2011, 2012 and 2013. Temperatures will be ‘adjusted’ again next month to make this the hottest August on record; adjusted the following month and each of the following months again to make Sep, Oct, Nov etc the hottest months on record ad nauseam . So the ‘rate of increase’ will remain a moving goal post, central moving averages not withstanding. LOL. I think any rate of warming could only be meaningful if it was limited to a small region of similar climate. Once you average everything globally it loses all meaning. Imagine doing a study of the incomes of 100 people over a year. Assuming they start at the same income let’s say 10 people experience a 10% cut in pay, 80 people experience no change, and 10 people experience a 20 percent increase. It would never be correct to say that the whole group experienced an average 1% increase in pay. Think about that while I try to mix up a batch of universally average paint color. But you present no actual evidence to support that claim. You can not decide if something has changed without evaluating the uncertainties in the analysis. That you have failed to due, likely because you know nothing about statistics. The next five or so years will be the conclusive. If the satellite data trend shows no sign of the exponential increase, so necessary to the narrative, the show’s over. Plaintiff lawyers should be sharpening their pencils. Once the CAGW hypothesis is laughed and eye-rolled onto the trash heap of failed ideas in about 5~7 years, real scientists without agendas will have to dig through GISTEMP and HADCRUT raw data and fix all the contrived “adjustments” that have been made. If fabricates fantasy numbers in boxes, not temperatures. You have points all the way to 2015. 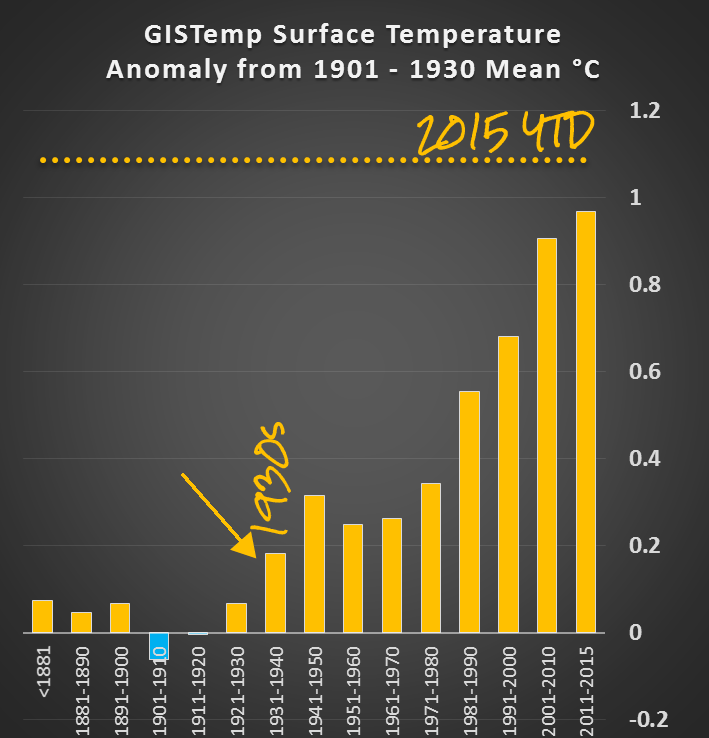 How did you locate the temperatures for the 60 months after 2015 to include in your regression? You also show values for 1979 in the satellite series. 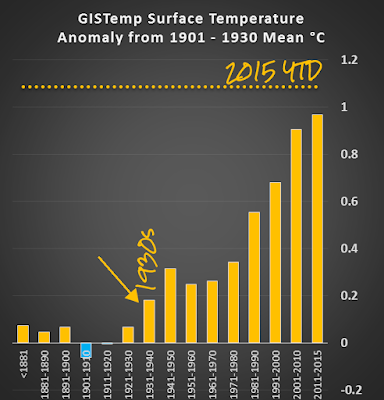 How did you average in the 60 months of satellite temperatures before the satellites were up? Steve Garcia comments on how the surface temperature is affected by the Pacific. He spoils it all by also being one of the deniers who confuses the rate of warming with the anomaly. Does he really and truly think it was hottest in the 1930s? Then he sinks into ordinary run-of-the-mill climate hoax conspiracy nuttery. A very inconsistent comment all around. I am pretty sure that the two warm periods correlate well with the Pacific Decadal Oscillation cool phases and that the cool periods of this/these curve(s) correlate well with the PDO warm phases – including the less-warming period beginning around 2000. This is damned near exactly what was predicted back in the very early 2000s – that the phase change (regime change) in the PDO would cause the warming to slow and probably reverse and had already begun to change. It is VERY significant that the high point of warming/century was in 1937. We’ve been beating them over the head bout the 1930s for over a decade bow, and they keep pretending that the 1930s didn’t happen. Pretend science isn’t science. When you have to pretend that inconvenient data is not there, you are not an f-ing scientist; you are a priest of The Church of Preaching to the Choir. Sou, as I'm sure you know, the theory of global warming indicates that the temperature trend in the lower troposphere should be greater than that at the surface, particularly in the tropics. So I certainly don't think that the satellite data is irrelevant. Furthermore, no one on the surface of the Earth experiences global average temperature, either, but that is still relevant to the discussion, no? The uncertainties of the satellite data are such that they don't show that accelerated mid-tropospheric warming isn't occurring. a) there is no single "theory of global warming". Are you are referring to the greenhouse effect? b) The lower troposphere should warm faster than the surface, which is partly my point. I won't be surprised if adjustments need to be made (again). El Nino should be showing up in the lower troposphere temperatures too, I'd have thought, by now. But I could be wrong. c) the temperature of the lower troposphere in the tropics does show the theorised profile. See "About that tropical "hot spot""
d).My point is some deniers want to reject the much more reliable surface data. They wrongly think that data used to estimate temperatures at different height profiles in the atmosphere is more reliable than surface data. In fact satellite instruments don't directly measure temperature and in some ways may be more difficult to work with because of all the adjustments that are required. Whereas some deniers seem to be under the misapprehension that there's a single satellite up there somewhere, that has a thermometer on it which is recording pristine surface temperature. And that surface temperature data is less useful. None of which is the case. Re your last sentence, I don't understand the point you're making in the context of this article. Of particular interest is Figure 2, which shows that during the war years there was a sudden spike in usage of engine room intake and hull measurements relative to bucket methods ... which would tend to create a warming bias. Also note that over the entire interval, the trend is toward less bucket use. Figure 4 shows global, hemispheric and regional results adjusting for bias as they detail in the body of the paper. The result is that the war decade is not so peaked. Interestingly, the authors say in the abstract that the highest uncertainties in the data are from the period immediately following the war. ... which obviously serves to give Watts' resident and guest cherry-pickers that much more room to say, "it's warmed faster in the past, no big deal." Thanks, Brandon. The people behind ERSST v4 did cite Kennedy (2011), so there's probably more to it than that. Thanks John. I hadn't seen that article. I wonder if that's the whole answer and if so, why it hasn't been resolved yet. I suspect that part of it could be that there's not an easy way to calibrate. That is, there was a shift without any overlap - unlike the shift to buoys. A moving average of 10 years sounds suspicious. Why 10 years? It sounds like a cherry-pick. I have played around with long period moving averages before and found they are sensitive to small changes in the period and start and end points. It could be the author of the WUWT article tried different combinations to get a desired result. I note that your moving average shows an increase in the rate of temperature change while the author's does not. I was curious and I want to learn a bit more about Excel. I managed to reproduce the WUWT author's chart with a bit of fiddling (Excel is like that). To give him credit he did explain his method in enough detail for me to reproduce the results - that level of description is not common. Straight away you can tell the "extensions" at the left and right of the graph are not right, I cannot tell how he calculated those and I did not even attempt it as it is the wrong thing to do in my opinion. If you are going to make a point of using Central Moving Averages and Central Moving Slopes you cannot then extrapolate or create data. You end up with the CMA starting at 1885 and ending around 2012. The CMS starts at 1890 and end around 2007. So the end of the author's chart are a work of fiction. 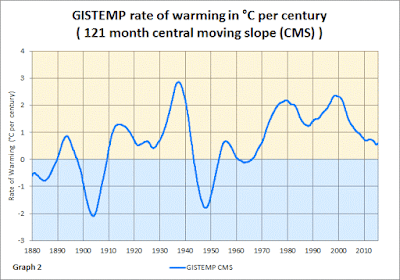 His conclusion about the rate of warming slowing down is wrong. It has dipped after 2000 but the dip is around the same size as the previous dip after 1980. I did my own rate of change chart based directly on the temperature data, not the CMA so I could show more data. Even using the strange 121 month moving average, the slowdown in the rate of change finished around 2010 and is accelerating again.